The Braves overcome an early White Buffalo charge and get 58 combined points from Dalton Renne and Blake Gobel to advance to state tournament. Last year, after finishing third in the league and being ranked tenth heading into the state tournament, Banks was playing with house money. Now, as Cowapa League champs and boasting the state's top ranking, this year's Braves squad is the hunted rather than the hunter — and they're up to the challenge. 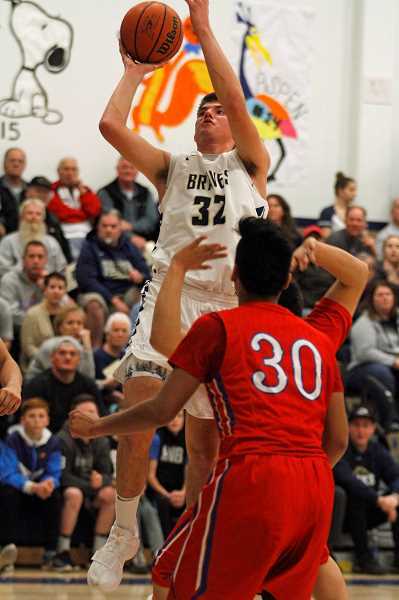 Following a two week hiatus since their last game, a regular season loss to Seaside, Banks withstood an opening flurry from Madras and ultimately routed the White Buffalo 102-58 in the state playoff's opening round March 3 at Banks High. Senior Dalton Rennie led all scorers with 31 points, and junior post Blake Gobel added 27 points and eight rebounds to help the Braves overcome an unorthodox Madras team who had Banks' attention before and throughout Saturday afternoon's contest. "I'm relieved," said Banks head coach Marcus Roche. "This is a style we haven't played against and they came out firing. They hit some shots, they had energy , so I'm pleased our guys weathered that storm in the first half." Madras, the 4A's highest scoring team, hit four quick threes and led for much of the first quarter before Banks finished the first with a 23-19 lead. But the Braves were noticeably flustered by the White Buffalo's early pressure, and showed some first round nerves with countless misses at the rim and a handful of errant pass attempts both in transition and in the half-court. "They started off looking real good, so we did get a little nervous," said Gobel. "We just had to get in the game and settle in." Banks ended the half on 16-2 run, giving the home Braves a 14-point cushion at the half and spring-boarding them to what would be a 59-29 second half edge. "In a game like this you have to value possessions," said Roche. "We were gambling too much in the first half, trying to get that steal and lay-up and they were hurting us with that. But we limited their direct drives in the second half and they weren't getting the kick-outs they were getting in the first." Gobel acknowledged some first half nerves, primarily due to Madras' style and a bit as a result of some sloppy practices early in the week. "At the beginning of the week when we heard how they play we didn't really know what to think," he said. "We practiced hard but had a couple of iffy practices, but then had a good one yesterday and got it going." With the game tied 27-27 midway through the second quarter, Gobel scored eight straight to give the Braves their first cushion of the game. Then after a Byron Patt basket for Madras, Renne scored twice and sophomore Jacob Slifka added a bucket before the half to put Banks ahead 43-29 at the half. Renne and Gobel kept things going in the third quarter, scoring eight of the Braves' first 10 points to increase the lead to 22 just a few minutes in. But it was the defense that changed the game, limiting the White Buffaloes' looks and quickly getting into transition to create easy baskets at the other end. "I think we did a great job of contesting shots and getting rebounds in that second half," said Roche. "We competed better and kept attacking. We have a lot of guys that can shoot threes, but we knew that wasn't the best way to attack these guys percentage wise." It never got any closer from there, as Banks continued to pile it on with a series of steals and transition lay-ins. But despite the lopsided victory, the Braves got an early test from Madras and were able to shake-off the rust from two weeks off and prior to next week's state tournament. "Coming into the game I was expecting a good game," Renne said. "I respect them. They've had some good games and they've been playing well, and in the playoffs anything can happen. But we executed tonight and I thought we played well." And now with the state tournament next, Gobel and Renne are excited to chase their state championship dreams. "I'm real excited for next week," said Gobel. "We'll practice hard and be ready for Thursday." "It's great to get back to that final eight," he said. "I'm very confident with the group we have, and if we keep executing and playing like we are, we're going to be a tough team to beat." In addition to Renne and Gobel, the Braves got 16 points from Dakota Bunn and 12 points from Slifka. Madras was led by Kanim Smith who had 17 points and four rebounds. 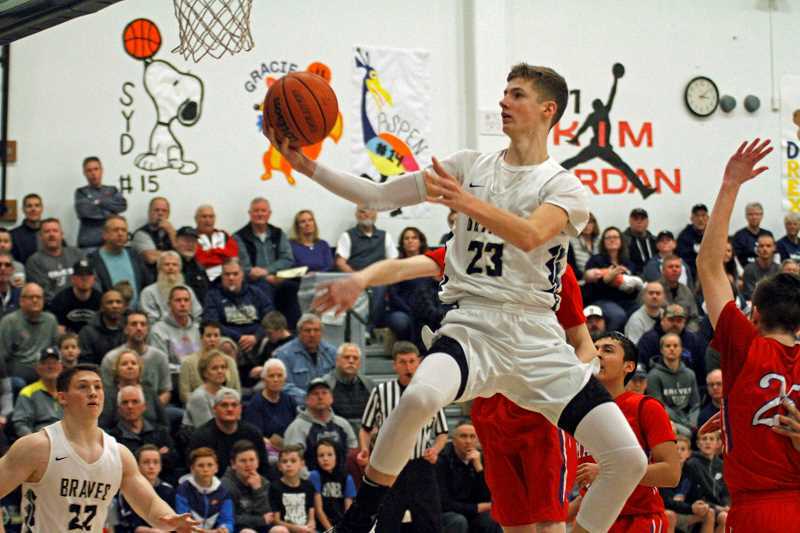 The OSAA 4A State Tournament is being played at Forest Grove High and Pacific University, and Banks is scheduled to open against Sisters, March 8 at 1:30 p.m. at Forest Grove High.